"The new era dawned for Factory with Happy Mondays' 'Wrote For Luck'. Employing the dance remix, if not for the first, but certainly the most effective occasion, the rode the giant wave of the balearic dance movement, Shaun Ryder and co becoming the unlikeliest of heroes to be adopted by the new pop generation. "In truth, it was The Hacienda, as opposed to the label, that became the focal point of events during this time. Alan Erasmus won acclaim for his burgeoning classical offshoot with agit-composer Steve Martland's 'Babi Yar' LP. Old faces like Kalima and The Durutti Column continued along their way, while Northside and Peter Hook's Revenge offered little in terms of musical inspiration. 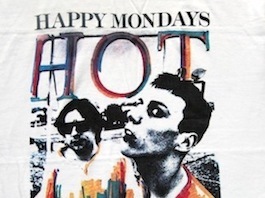 Happy Mondays ruled the roost with massive releases like 'Hallelujah', 'Step On' and the 'Pills 'N' Thrills And Bellyaches' LP, but even they weren't generating the kind of sales required to keep the organisation in the black."